Today, we go hands-on with the Aqueon water changer, a handy device that will drastically cut down the time it takes for you to perform a water change! Forget hauling heavy buckets of water back and forth through your house. The Aqueon water changer allows you to drain water directly from your tank to your sink and from your faucet to your tank. Is the Aqueon water changer worth your money? Do you need an Aqueon water changer? Everything you need except a kitchen sink! Simply measure the distance between your fish tank and faucet. Now all you need to do is pick whichever water changer will fit. If you find your required length is on the borderline, I recommend that you choose the next size up! 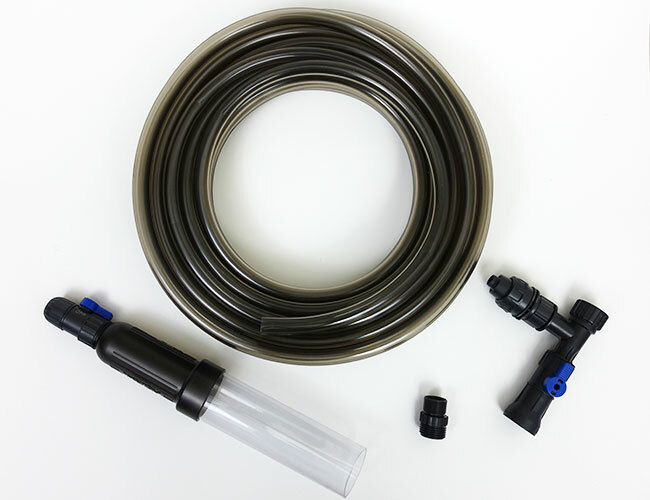 The Aqueon water changer has a similar design to every other water changer on the market – essentially an extra-long gravel vacuum that connects to your faucet. Let’s take you through the Aqueon water changer, piece by piece, starting with the end that goes inside your aquarium – the siphon tube. 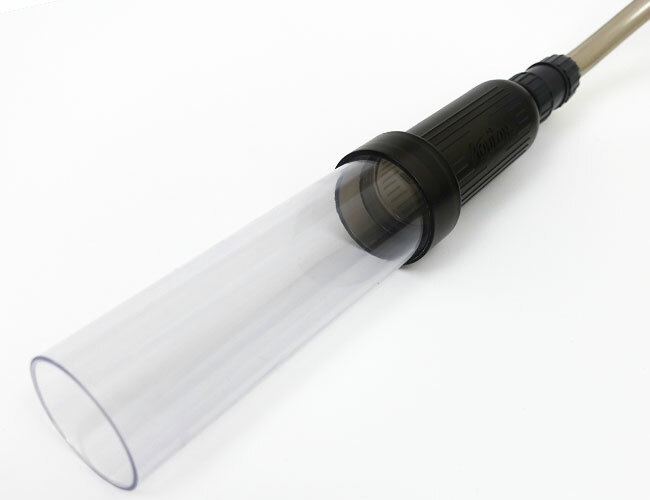 Use this to vacuum the gravel substrate of your aquarium while draining water from your tank at the same time. An on/off switch located on the handle can be used to stop and start the flow of water. Before it finally ends up at the flow assembly valve, which gets installed onto your faucet. Here, the water will flow out into your drain. Combine all these parts together, and you have the Aqueon water change system. Now all that’s left is to refill your tank! Toggle the switch on the flow valve and turn your faucet on. Water will now flow back through all these pieces before finally emptying into your tank. The Aqueon water changer has two optional accessories available, each sold separately, to enhance your water changing experience. Have a deep tank? 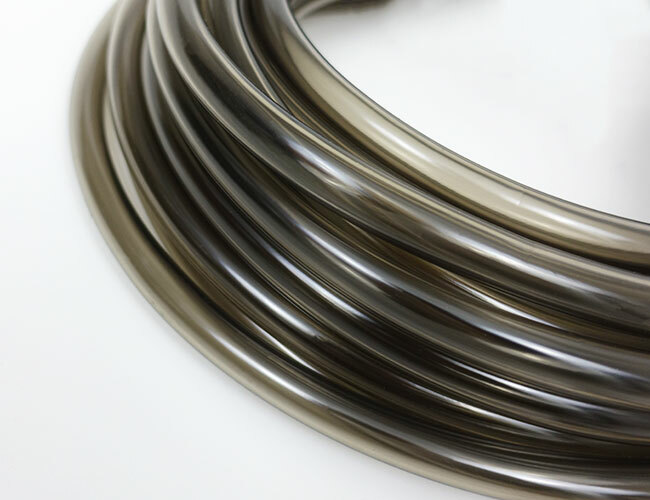 You might find that the siphon tube that comes standard is too short to reach the bottom of your tank. 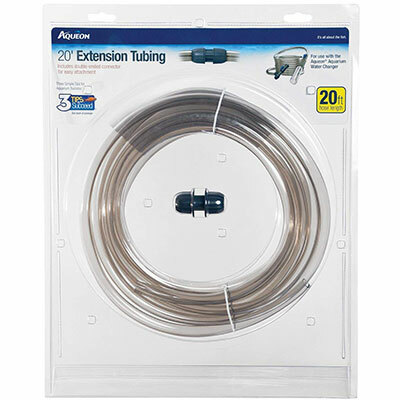 Fortunately, Aqueon also sells a longer siphon tube. The siphon tube easily attaches to the handle of your Aqueon water changer, adding extra length for those of you who need it! Just set up your Aqueon water changer only to discover it’s juuuuust too short to reach your tank? Or, maybe you have moved to a new house and your water changer is now too short to reach your tank’s new location. 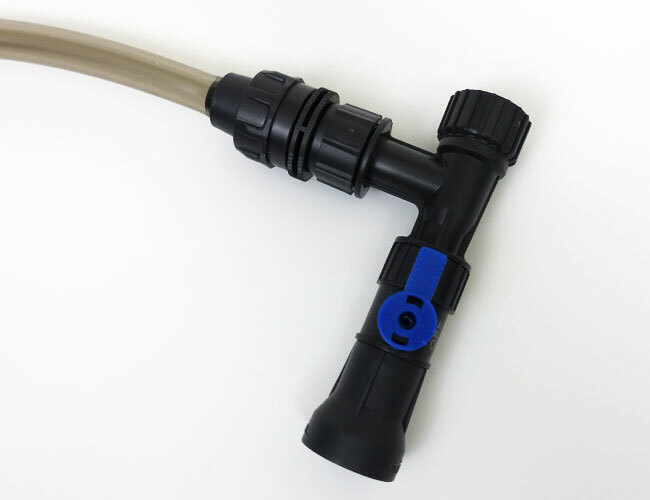 Don’t panic – simply attach this extension hose to your water changer for an extra 20 feet of reach! Straight up, the Aqueon water changer makes routine water changes a breeze. Forget making multiple trips back and forth from your kitchen sink with an overflowing bucket of water – using this water changer is comparatively effortless. In fact, if I perform the same water change with a bucket and siphon, it would have taken 20 minutes longer than using the Aqueon water changer. 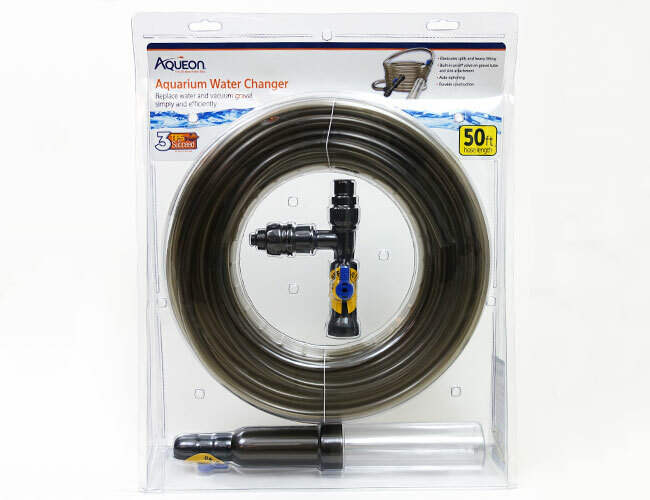 The Aqueon offers the cheapest water changer system on the market. And given that fishkeeping can be a very expensive hobby, we appreciated the low price point. 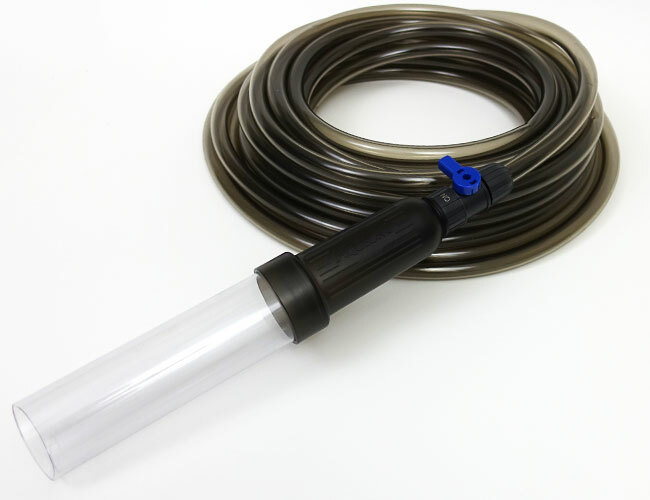 Aqueon’s water changer comes standard with the longest siphon tube of any water changer we tested. You see, while the gravel tube itself, measures a paltry 7 inches, the handle that it slides into adds an extra 6 inches to its length. That’s a total length of 13 inches. For many of you, this will be more than long enough to reach the bottom of your aquarium. Out of all the water changers we reviewed, this was the only one to break on us. The plastic thread that connects the flow valve to our faucet stripped on our very first use. Being used to the brass faucet adapter found on the Python water changer, I was unsure as to whether or not this was my fault – I may have overtightened the plastic fitting. No biggie, I thought. I’ll just use one of the spares that we ordered for photos. The second attempt was a success, and the fitting held up just fine. However, it did not remain that way for long. Over the course of testing, we screwed and unscrewed the plastic adapter multiple times. By the end of testing, the plastic threads had worn down to the point that water was starting to leak during use. It immediately became apparent why the other water changers use brass fittings – they are much more durable. It’s not something we noticed on our first few uses. But it soon became apparent – the hose of the Aqueon water changer kinked easier than the other water changers we tested. There were countless times during testing when we had to stop to untwist the hose because water had gotten stuck. Thanks, Aqueon. You stunk up our office. Other water changers we tested had a slight odor when we first opened the packaging, but nothing like the eye-watering stench that the Aqueon water changer gave off. I would go so far as to say if you have a sensitive nose, I would skip this altogether. 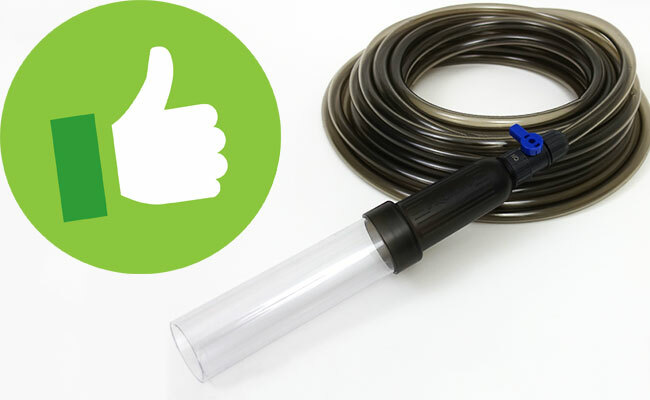 Sure, the Aqueon water changer might offer a generously sized siphon tube, but those of you with deeper tanks won’t be able to gravel vac your aquarium without getting your hands wet. 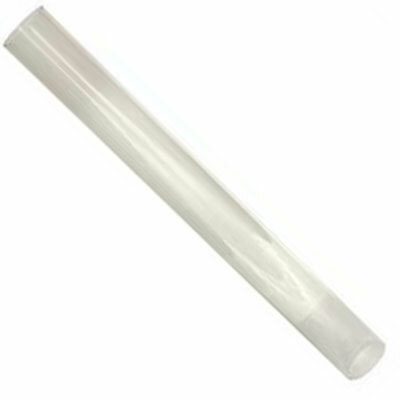 While Aqueon offers a larger siphon tube, sold separately, it only adds an extra 18 inches to the handle. Considering that other water changers on the market offer siphon tubes up to 72 inches in length, the Aqueon water changer… err… falls short. While we appreciate that Aqueon sells replacement parts, not everything on the water changer is replaceable. If the handle on the siphon tube breaks, you have no other choice but to buy an entirely new water changer. In fact, based on our experience, you should probably steer clear of it. There is no denying that Aqueon’s water changer saves time and effort when performing a weekly water change. 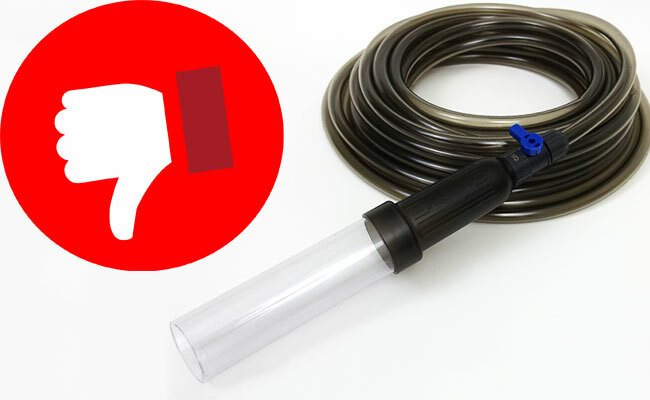 Unfortunately, the Python water changer, being such a high-quality product, made the flaws on every other water changer we tested extra-noticeable. If you have never tried the Python water changer, then you might find the Aqueon water changer to be a good enough product. But with flaws like fragile fittings, needing to unkink twisted hose, and that strong chemical smell, I find no reason to recommend it. Don’t get me wrong, Aqueon is more than capable of making great aquarium products. Their Aqueon Pro is one of the best aquarium heaters available on the market. I rate the Aqueon water changer 2 / 5 starfish. What do you think of the Aqueon water changer? Let me know in the comments below!